Happy Wednesday! I created an I Am Roses Christmas card today for you guys. I'm using more of the MME Festive & Frost paper stack that I purchased last year. I am determined to use up this 12x12 paper pad this year, no more hoarding! LOL. The stamp set I used is from Inkadinkadoo Holiday Filigree. To punch out the sentiment I used the large oval punch from Stampin' Up!. Using the Grommet Tags from Spellbinders, I cut some brown cardstock and layered the sentiment over that and added some silver brads. All the papers were edged with Walnut Stain Distress Ink. Out of some of the pattern paper I used my Quickutz Snowflakes die and placed them in the background. The White Puffy Daisies and the snowflakes were sprayed with my Lindy's Stamp Gang Glitz Spritz in Scintillating Silver. I used these Small Brown Poinsettias for the card to match the brown tones in the pattern paper. To make the card more lush, I added some White Cherry Blossoms. On the corner of the card I cut out this sled from the pattern paper. I then layered some of the Natural Skeleton Leaves for the flowers to lay on. So there is my card and I hope you guys enjoy the rest of your day. Thanks for stopping by! I finally finished my dress form project, here it is! I love fairies and dress forms, so why not combine both and I did. This was a paper mache dress form that I had purchased from my local scrapbook store. All the beautiful floral embellishments I used are from I Am Roses. To start off, I painted the entire dress form with a pink acrylic paint. After that I coated it with a crackle medium. I let that dry then I used white acrylic paint as the top coat. I love the end results. I covered the the middle part of the dress form with Gardenia Curly Petals to mimic the skirt. I added some mini rhinestones and pearls randomly on the petals. I placed some lace trim and Natural Skeleton Leaves on the bust. To add more interest to the neckline, I added some mini pearl flat back pearl trim and a rhinestone button. On the base of the dress form, I wrapped a White Paper Flowers Spray and randomly placed some Pink Paper Roses, Pink 2 Tone Semi Open Rose Buds, White Paper Roses and more Skeleton Leaves. My favorite part is the wings. I used more of the skeleton leaves to form the wings, three on each side. They look very delicate and whimsical. I tied some lace trim into a bow and used this beautiful large crystal flower from KARLAS001 Etsy. To add a little more detail, I place some mini flat back pearl trim down the lace to mimic buttons. So there is my Fairy Dress Form for you guys this Friday. I hope you have enjoyed it as much as I did making it. For a more detailed look, you can view my video here. Have a great weekend everyone! If you don't know about it already but Stamper's Dream is having their closing out sale. You can read all about it here and also there's a coupon code you don't want to miss out on. I used the JustRite Bon Voyage stamp set in my card for today. I layered several of the images on dimensional foam pop dots. I used my Spellbinders Labels Four dies to cut the pattern paper (Prima Printery). There are coordinating dies that do go with this stamp set, unfortunately I don't have them but I think it turned out fine with the ones I chose to use. I added some rhinestones for that extra sparkle. The "Bon Voyage" sentiment is also from the same stamp set. I cut my own little banner and inserted it behind one of the images. All the papers were either distressed with Black Soot or Antique Linen Distress Ink. The stamp set also came with an Eiffel Tower image. I stamped it in the inside of the card and added a few strips of the Prima Printery paper also. So here is another card for this week. Don't forget to check out Stamper's Dream to get some great deals. Thanks for stopping by, have a great evening! Happy Thursday! I just wanted to quickly share this Copic video that I recorded using my Logitech C910 webcam. My first time using my webcam to make videos, still needs tweaking but I love the quality and clarity of the video. The colors I used are listed in the description box in the video. Thanks for watching, enjoy! Happy Wednesday! I wanted to share this birthday card I created this afternoon. I love The Greeting Farm stamps and I wanted to try something different. Instead of using Copic paper to stamp the image on, I went with kraft cardstock. I really love the vintage feel it gave my image. I then colored the image with my Copic markers (colors listed below). The colors look much softer. I distressed all the paper edges with Walnut Stain. The image is popped up on dimensional foam pop dots. On the bottom I added pattern paper punched with a scallop border punch. I then layered some trim and buttons from my stash. I used a cupcake border punch on some more of the MME pattern paper. Here is a video I made showing how I colored the image onto kraft paper. I also show a similar card with a different trim. Enjoy the rest of your day and thanks for stoppng by! Good morning everyone! Welcome to your final stop for the Stamper's Dream & Friends Blog Hop! Here is my project for today. I made this card using the JustRite Christmas Trimmings stamp set. I love all the options you are given to decorate your Christmas cards. I decided to use the wreath stamp and the sentiment "Believe". The wreath was colored with my Copic markers. I used Tsukineko's Rich Cocoa to stamp the images. The paper collection I used was from my stash, MME Festive & Frost. All the papers were edged with Walnut Stain Distress Ink. The wreath image was popped up on dimensional foam dots. The die I used as the base was Spellbinders Fancy Tags Two. The little pieces that came off the die after it was cut was used as little accents above and below the wreath. Brown seam binding from my stash was my ribbon of choice. It made my card look like a Christmas present. To finish the inside of the card, I just punched a strip of scrap paper with a scallop border punch. So there is my card for the hop. All the links to the products that are still available at Stamper's Dream will be posted below. It is with a heavy heart that I announce I've decided to close Stamper's Dream ! After many tears, and much prayer I just know it's the right thing for me. I really feel the need to reclaim my life and spend more time with family and friends. My grandchildren are growing up so quickly! And let's face it...no one can do it all! Not forever, anyway. So...my loss is your gain! Everything in the store is 20% off with the coupon code Farewell2U. Just enter on the checkout page in the coupon section and it will take 20% off the lowest marked price of the items in your shopping cart! There is a $20 minimum to activate the coupon. Sorry, but there will be no free shipping during the liquidation. My undying thanks to members of The Dream Team both past and present! I have communicated with them privately...and they all know how much they mean to me. Always have. Always will! I would just like to say thank you to Michelle for this fabulous opportunity to have worked with her and the amazing design team members. Thank you to all who have joined me through this Stamper's Dream adventure =) If for some reason you have just joined in on this fabulous hop, please visit the other design team members blogs for their fabulous projects. Don't forget to take advantage of the awesome Sale/Discount mentioned above. Thank you and have a fantastic Tuesday! Happy Heat Wave Wednesday! It is hot hot hot up in here =) I have a Christmas card for you today brought to you by Stamper's Dream. I have been very good and I used paper from my stash. Woohoo! I distressed the edges with Walnut Stain. I used the dies from Spellbinders 2011 Heirloom Ornaments. They are suppose to be Christmas ornaments but I decided to make a flower instead. I used a circle punched paper as a base and glued individual ornaments with the point sticking out. I then used one of the smaller dies for the center and did the same thing. I adhered them with hot glue. For the center of the "flower" I used a vintage button. The sentiment "A Gift for You" is from JustRite Christmas Mini Sentiments. I embossed it with white embossing powder on vellum paper. I cut a little ribbon tail at the end and adhered a small pearl. I laid a large piece of crochet trim at the back and some pearl flourishes. So there is my card and I hope you look at your dies at a different way =) All the product links available at Stamper's Dream are listed below. Have a great evening! "Season's Greetings"? It's only October LOL. Well it's never to early to start holiday cards. So here is a card that I created. Believe it or not I used non-Christmas paper for this project. The two paper stacks I used were Crate Paper Portrait Collection and Pink Paislee Hometown Summer. I haven't bought any of the new Christmas collections out there yet, so I went through my papers and found these. The wood grained paper is from Crate Paper and the red w/stars patterened paper on the banner is from Pink Paislee. All of the patterned papers were lightly distress with Walnut Stain. The cute little image is one of the many images from the JustRite Seasoned with Love Set. I colored her with my Copic markers. I used my 1 3/4" circle punch and my Spellbinders Floral Motifs dies for the outside as well as the inside trim. The cute mini December calendar is cut from one of the designer papers. I popped up the image on thin dimensional pop dots. The sentiment "Season's Greetings" is from the JustRite Christmas Mini Sentiments Set. I love how thin this card is, easy to send out in the mail without any special envelope to make room for dimensional embellishments. So this card was really quick and fun to make. Please visit Stamper's Dream for the products listed below. Happy Wednesday! Lindy's It's Fall Y'all Contest! Like the image says, "It's Fall Y'All". 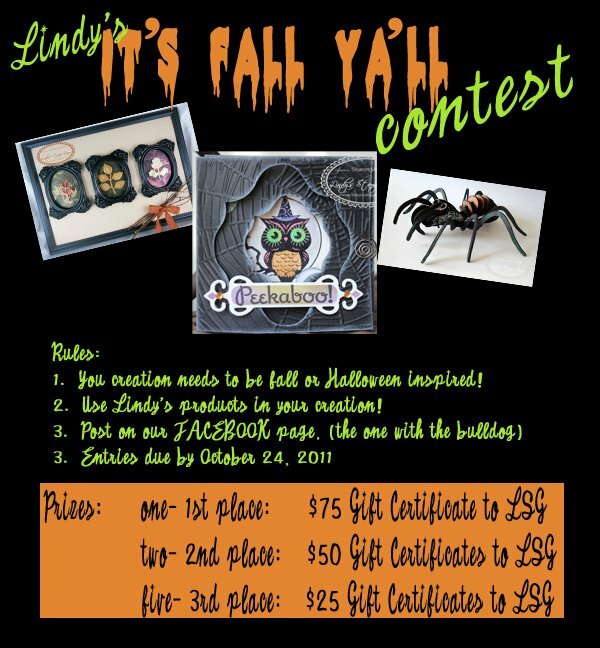 Lindy's Stamp Gang is having a contest on their Facebook page. There are amazing prizes. If you love Lindy's Stamp Gang and you use it on almost all your crafting projects then this contest is easy peasy for you. The contest is going on now and ends October 24, 2011. Here is my spooky project to hopefully inspire you to create. It's an altered wooden hanging spider. This is one side of the spider. On the outer body, I sprayed it with Starburst VavavaVoom Violet. After that I covered it with glue from a glue stamp pad. I then sprinkled some ultra fine black glitter. I lined the body with white rhinestones and colored them black with my Copic marker. The middle body was embossed with several layers of the Jack o'Lantern two tone embossing powder from the Jolly Jacks Set. The inner body was sprayed with Starburst Freaky Franken-Lime. This was a very rich and bright lime green color. I then added tiny white rhinestones and colored it again with my black Copic marker....I guess I should buy some black rhinestones =) To finish off this side of the spider, I took some white seam binding and sprayed it with the Starburst Witch's Potion Purple. On to the other side. I kept the outer body the same as the reverse side. The middle body frame is sprayed with the Starburst Witch's Potion Purple and colored over with the Magicals Witch's Potion Purple for a more deep color and shimmer. The inner body was also kept the same as the reverse side as well. The last thing I did was add the white seam binding on this side and colored it with the Starburst Hag's Wart Orange. I love how my spooky spider turned out. For a more detailed look of my project, please watch the video I made here. Thanks for stopping by! Now it's your turn, what will you be making for this contest? It's Monday and I have a birthday card to share. I am using the image Birthday Anya II from The Greeting Farm. She is so cute, I just love her cupcake. She is colored with my Copic markers. I added a "Make a Wish" sentiment also from The Greeting Farm. The papers I decided to use for that girly shabby look are from MME Blush. One of my favorite paper pads and I used up all the papers, guess it's time to restock! LOL. Okay let's get down to the gorgeous I Am Roses flowers. I decided to make my own floral spray along the side of the card. The large pink flower is from a Random Sizes Pink Tone pack and I used it as the base of the spray. I have two Pale Green Leaves in the back. I used lots of pink tones for the flowers. I staggered two Mini Pink Semi Open Rose Buds and added some White .25" Mini Paper Roses. The last flower I used is the Curly Shaped Pink Rose. Ta Da! So there is my card for you today. I hope you liked it. All the I Am Roses products/links will be listed below, as well as the other supplies used. Thanks for stopping by! Enjoy the rest of your day. Happy World Card Making Day! It's a new month and it's time to start fresh. 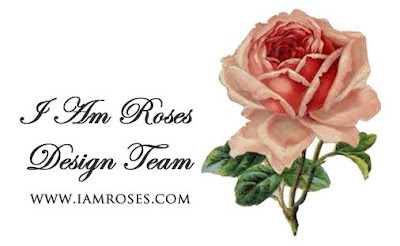 As you know I am a designer for I Am Roses and a new term has begun this October. I am thrilled to have been invited back as the Challenge Coordinator. Woohoo! I am so excited. If you are not yet familiar with the luscious flowers from I Am Roses, please visit the website. You will not be disappointed. The majority of the flowers I use on my projects are from there. So to start off this new term, I Am Roses is having a "Haunted Halloween" Creative Contest. The contest is being held on YouTube. Please visit the I Am Roses YouTube Channel: iamrosesdt. For all the details and rules, here is the official contest video. Good luck to those who will participate! Thanks for stopping by, have a scraptastic weekend!